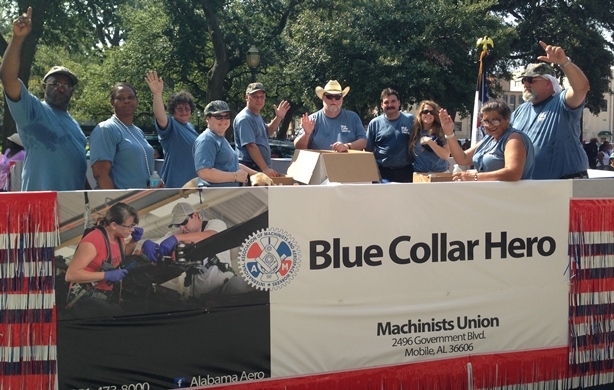 Alabama Machinists came out in large numbers to take part in the annual Mobile Labor Day parade. A large contingent of Machinists from central and southwest Alabama converged on Mobile this week to take part in the city’s annual Labor Day parade. It was a chance for the Machinists Union, which represents some 6,000 workers in the surrounding area, to join with other unions in Mobile in celebrating the many social and economic achievements of the American worker. The IAM has recently increased activity in Mobile in order to provide support for both current members and workers at Airbus who have expressed interest in forming a union. Keep up with Alabama workers at AlabamaAero.org or on the Alabama Aero Facebook page.